In a future world turned to ash by the return of dragons, people with an immunity to their smoke are a valuable commodity. So valuable they will even take Brannigan, a captain in the fire services one week from retirement. 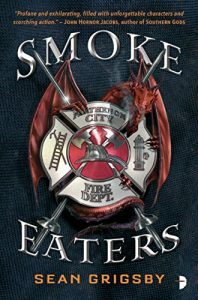 Reassigned to the Smoke Eaters dragon-fighting force, Brannigan is relegated back down to a rookie and told to forget everything he learnt in the fire service because the Smoke Eaters are different. But it is Brannigan’s thirty years’ experience as a fireman that tell him these new dragon attacks are not as random as they seem. The fire service is an under represented service in fiction and, as a firefighter himself, Sean Grimsby brings insider knowledge to his writing. His descriptions of the behaviour of smoke and fire, the heat and intensity, the life or death situations fire fighters make every day elevates this story. Brannigan is an engaging main character. I can’t remember ever reading about an ageing firefighter main character with a dodgy knee and bladder issues. Add to this his jaded world view and his frustration that his experience is counting for nothing, and Brannigan is an unforgettable character. He has his flaws as well. Despite claiming commitment to his wife, she isn’t the strong force in the book she initially appeared she would be, and he describes most women in relation to how attractive he finds them. These feel like unnecessary interruptions to the flow of action. It’s breathlessly paced and for the most part, it works great. For me, there are only two areas where it didn’t work so well. The first is a trip to Canada. It’s a short jump in the narrative and the journey itself is essential. But it isn’t long enough to build any emotional attachment to characters who have a very big impact on Brannigan. 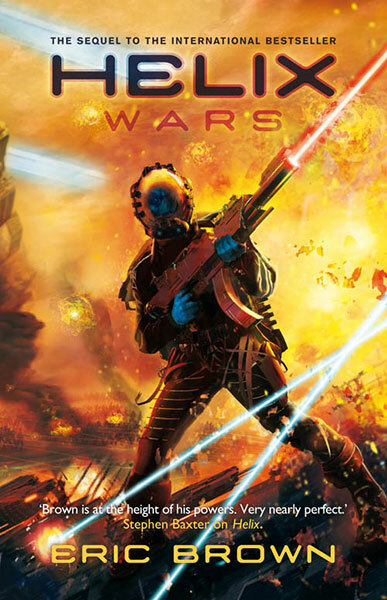 The second is it feels as though the final resolution (no spoilers here) isn’t given the weight it deserves. The science behind the dragons is intricate and believable with classifications of dragon, scaly biology, and unique sets of behaviours. These are not your fairy tale dragons content to sit on their piles of gold or play clever riddle games. They are uncontrollable, old school beasts of mass destruction needing a mixture of old school and futuristic tech to take them down. This is a world where dragon-fighting is a learning on the job and experience is as important as the weapons provided. 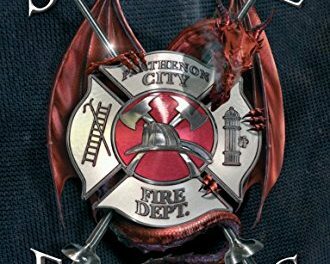 The dragons have only been back for seven years and there is a real sense of people, including the firefighters, still coming to terms with what’s happening. Maybe I’m reading too much into it, but I found a deeper message of how the emergency services have changed. After events like 9/11 and other terrorist attacks, the role and demands of the fire services have changed. What better metaphor for these dramatic changes in our world than a dragon? The stakes are high, the pace is fast, and the villains are huge and scaly. From start to finish, this is one white knuckle fire fight of a ride.